Construction in Process 1981 the community that came? The project Construction in Process 1981 – the community that came? refers to the legendary international exhibition opened in Łódź almost two months before martial law was introduced. Artists from Łódź, representing various art disciplines, invited 54 leading artists from all over the world to partake in the show and create art works here, on the spot. The works themselves were important, yet the very fact of experiencing co-operation in creation, the informal contacts and enthusiasm were by no means less meaningful. In referring to the tradition of the inter-war vanguard movement, proclaiming inclusion of art into the area of daily life, projects were executed in presence and assistance of workers employed in Łódź factories, of materials accessible here as well as artists were guests of strikes, which proved that they were not indifferent to the history they witnessed. The historical circumstances turned the exhibition into manifestation of solidarity with the Polish nation; its organization proved that alternative community could be accomplished: ephemeral open to experiment and uniqueness. Thirty years later we pose again the question about the way culture can sculpt socio-political reality. The answer will be formulated not only by referring to the historical exhibition in 1981, but also during meetings with artists, organizers and participants of Construction in Process as well as researchers interested not only in the event, within the frameworks of discussion panels open to the public. Discourse about the initiative of artists comes into the present sphere of debate in the area of culture, especially with regard to the social effects. The power of Construction in Process lied in overtaking the ground of managing culture by artists as well as igniting the stimulus to co-operate in various communities: establishing a kind of community, which satisfied, for a moment, the need of active participation. The initiator of the idea was Ryszard Waśko who organized the exhibition assisted by students of the Łódź Film School. The show was conceived as the presentation of works of artists whose interest and practice was post-constructivism and minimalism. Organization Committee of the event persuaded the city authorities to offer accommodation to coming guests, organized meals and found the space to put the works on show. The Independent Trade Union “Solidarność” offered its patronage of the event. Municipal Transport agreed to give its factory hall facilities (in PKWN/ Dowborczyków street) for the purpose. Association of Culture Creators offered the formal side to the group without institutional ground. The initiative was also supported by Muzeum Sztuki and the Film Group Aneks. The invited artists found inspiration in the situation they found in Łódź and they appropriated to the material and financial possibilities. Crudeness of the factory hall adopted for exhibition needs provoked similar solutions. Martial law and the real danger that the works created out of censorship and the bureaucratic machine of official institutions could be destructed resulted in placing them in the storerooms of Muzeum Sztuki, a shelter for this not entirely legal deposit of the de-legalized Independent Trade Union “Solidarność” – since 2005 – a gift of the re-born trade union. 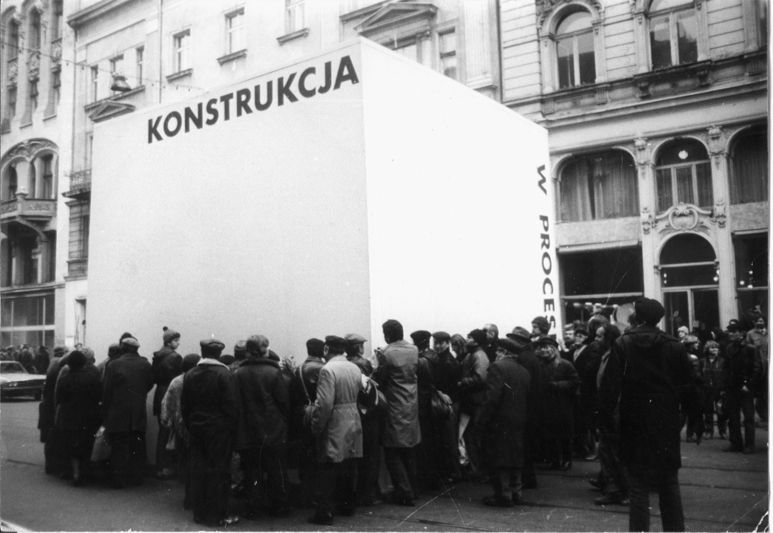 The exhibition Construction in Process 1981 – the community that came? will be associated with a presentation of a documentary based on interviews with participants of Construction in Process and a publication. The exhibition is curated by Anna Saciuk-Gąsowksa and Aleksandra Jach.